This post has a long introduction on how Indians typically eat. If you simply want the recipe, scroll all the way down. I reflected a lot about what to title this post/series; Calling it another Indian recipe did not seem sufficient, since my intent with this post was to break away from the stereotype of Indian cuisine often seen, well, outside India, viz. curries and spices. Perhaps, it was about building a deeper connection with the everyday Indians? Or, perhaps, it was my nostalgic projections upon you, my benevolent readers? Would that be the real indian food of regular Indians? In the end, I decided to call it neither 'everyday' nor 'real' or 'regular' because, well, it is none of those in my present context, even though it was my everyday reality when I lived in the country and continues to be for billions (oh yes! the advantage of numbers!) still today. I decided to go with 'Progressive' because whether you are an Indian living abroad or a non-Indian falling in love with the cuisine, cooking the simpler dishes is actually more a labor of love and courage than the standard issue curries. Indian meals are typically multi course affairs, even if they are all presented on a single thaali! And, the real reason for that is that the simpler the dish is, the greater its dependence on the flavor and quality of the ingredients. Wait! I'll get to this in a minute. Let me first tell you how this idea began. First, I have developed a recent craving for the foods that I grew up, predominantly vegetables and those that were very simply cooked. We called these poriyals, varuvals, koottus, gojjis etc (in Tamil). None of these words bear literal translation in English except to be bunched together as kind of "vegetable sautes". But, the truth is that each name signified a specific style of preparation, agnostic of the vegetable or protein used. For example, using a bit of cooked lentils to make it wholesome or desiccated coconut to finish or boiled and fried. None of these distinct preparations were ever fused together, because, well, that would neither be right nor would there be a name for it. Our Indian languages do not carry a word for "Fusion" or "Mash-up". You could just as well have vendaikkai varuval (okra fry) as Iral varuval (prawn fry). Second, I am a South Indian, hailing from a region whose cuisine is even harder to find than our North Indian cousins, beyond dosas and idlis. If you looked for pesaruttu or adai or vethai kozhambu, you would be hard pressed to find food service places offering these. In part because, the British were never quite as successful in the South as they were in the North, in part because the Spice Route tracked through the North and in part because the south Indian dishes classify as either being too peasant or too involved and all with distinct flavor profiles that require a slow burning love. Third, on two separate recent occasions, I witnessed the surprised and rather unappreciative reaction of Caucasian friends to the 'milder', non-spicy, non-curry food that Indians eat everyday! That really gave me the impetus to start this series. Now, back to the reason, why, even as an Indian, I tend to default to the stereotyped dishes and not the softer milder ones I actually adore more. The truth is, I never liked kurmas (what is typically called curries elsewhere) much growing up. My true favorites were the poriyals (dry, no-sauce, vegetable sautes) and even more simply, the boiled greens mixed with ghee! I called all these by the generic word Keerai, that simply translates to greens. Cooking the simpler Indian dishes is actually more of a labor of love and courage than the standard issue curries. The reality is that there are an innumerable variety of edible leaves that are each suited to a certain way of being cooked - some bitter, some mild, some stronger. I, honestly, don't know the name of any of them. Even if I saw them, I would not be able recognize them or tell you the best way to cook them. As it happens, my lack of knowledge is never called upon because, now, my choice are limited to a few varieties of which perhaps one or two can be cooked this simply - spinach, and..... um...?!. Actually, tops of radishes, turnips, beets can also be cooked similarly! Recently, I found a bunch of red veined and red leafed greens at the neighborhood Indian store. Understandably, I got super excited. I remembered this type; it was one of my favorites. It was called Mulaikeerai, Amaranth Greens and although the name was not top of mind, Google was a good little helper! I excitedly came home and proceeded to make a Poriyal with boiled chana dal spiced simply with green chili and turmeric. Oh the divine exaltation of my palate!!! Ah! Bliss. Course 1: Rice and Sambhar / vegetable kozhambu (spicier and definitely with tamraind)/ keerai in saucier form, with sides of raw salad, dry vegetable poriyal and/or fried Meat. Alt Course 1: Rice with chicken of mutton kurma or fish kozhambu and sides. There is always some dry vegetable. Course 2: Rice and Rasam (Rasam is a digestive course) with sides and pickle(s). Course 3: Rice and Yogurt with pickle(s), sides and perhaps a fried dry chilli. Indian meals like say the French and Italian are typically multi course affairs, even if they are all presented in one large plate, thaali. A meal is never one single protein and one carb. It is a transition from heavy through digestif to finisher. A typical south Indian meal would be three course. If it is a special day, there will be a sweet served at the end. And, if with company, also some filter coffee (alcohol is still a vice in most homes!). But, if it is allowed, an after dinner Scotch is a well rounded meal! As India got more cosmopolitan, sometimes rotis transplanted rice and dal the place of sambhar. Yet, I would NEVER think of having just roti-dal or rice-sambhar. There has to be some dry vegetable to go with it, even if it is potato fry! So, that is how there is a simple yellow dal in this post. Sambhar truthfully is more involved (takes time) to make properly and not as versatile as the plain dal. So, I make the latter more often. 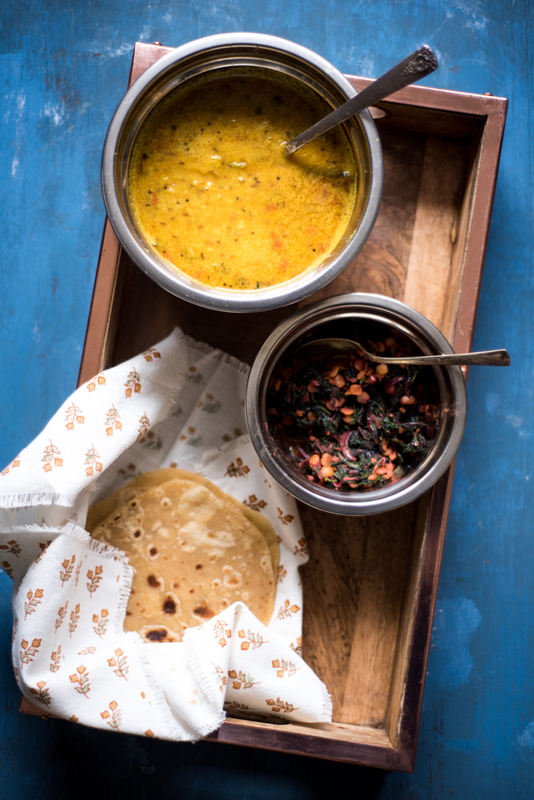 I leave you with the recipes for the tadka dal and the mulai keerai poriyal. The greens are mildly bitter, which, adds a depth of flavor to this plain dish. But, you can certainly substitute with spinach or perhaps even try broccoli rabe! In a frying pan, heat 2 tablespoons of oil and when hot, add the onions and green chilies and sautè till soft. Add the turmeric and fry till the raw smell goes away. Add the washed greens and close the lid, so they can wilt. Add the cooked lentils, cover and cook on low for a 5-8 minutes. Tadka refers to toasting seeds and spices in oil that then become the base or finish for the dish. In Tamil, it is called thaalichal. In a thick bottomed pot, heat one tablespoon ghee and pop the cumin and mustard seeds. Add the curry leaves and green chillies along with asafetida and turmeric and cook till the spices are no longer raw to the nose. Season with salt. Add the onion and garlic and sautè till soft. Mix the dal into the spiced base and stir to incorporate. Pour in water and bring to a rolling boil. Lower heat to a simmer and let it cook for 30 minutes. Add the remaining ghee on top and cover till ready to serve.